Once data have been acquired and processed, CDIP makes them available using a variety of services. In addition, the web site offers a wide range of tools that provide graphical, tabular, and text analyses of realtime, historic and modeled data. In this way all users - from researchers looking for the most detailed, extensive data set possible, to surfers just checking the waves - can find the information that they need. At the heart of CDIP is accurate, high-quality scientific data that is fully described using FGDC standard metadata. CDIP’s entire archive of observed and modeled data can be found through our THREDDS data server. THREDDS was developed by Unidata at Ucar in Boulder Colorado and allows us to serve our data using a variety of services such as OpenDap and OGC SOS. The THREDDS data server is actually serving Unidata netCDF formatted data files. Our web site provides a variety of plots and statistical data summaries which can be accessed from any station’s data page. These visualizations and tabular reports are generated using the netCDF formatted data with the exception of a few products generated from pressure sensor data. CDIP sends the NDBC a full spectral file in XML format. This facilitates integration with GTS/AWIPS and allows dissemination to NWS offices. CDIP deploys and maintains instrumentation in several of the Integrated Ocean Observing System regions. By collaborating with the various regions, we hope to enhance coastal observations. To be responsive to the changing demands and needs of its users. CDIP’s website is also equipped to present a range of text and graphic products based on spectral data submitted by cooperating agencies. For details on this process, please contact us and refer to our data submission guidelines. The USACE’s Wave Information Studies (WIS) program makes extensive use of CDIP buoy observations for model validation. The relative locations of WIS output points and CDIP buoys (as of Jan 2016) can be viewed in a kml file. CDIP is an active member of the QARTOD (Quality Assurance of Real-Time Ocean Data) effort. This is an IOOS community effort to standardize quality assurance and quality control parameters among data providers. Thus far, waves, in-situ currents, remote currents and CTD have been addressed. Summary tables of quality control measures have been developed for both waves and in-situ currents; refer to the links below. To assist with the wave measurement community’s comparison and validation of various wave sensors, CDIP has developed a a special tool for analyzing spectral wave data. Details from co-location experiments and the tool itself can be accessed online. In partnership with the Joint Technical Commission for Oceanography and Marine Meteorology (JCOMM) , wave sensor intercomparison test results may also be found on JCOMM’s Wave measurement Evaluation and Test page. In February 2015, CDIP updated the ‘Flooding Index’ forecast plots. In accordance with current reseach on wave runup, the new plots are not based only on the tide and wave height, but also take the wave period into account. The resulting water level predictions are generally lower than those from the old model, but they should be significantly more representative of the actual water levels observed at the coast. For more information, please refer to the documentation below. High tides and large waves erode beaches, damage property, and flood coastal highways. 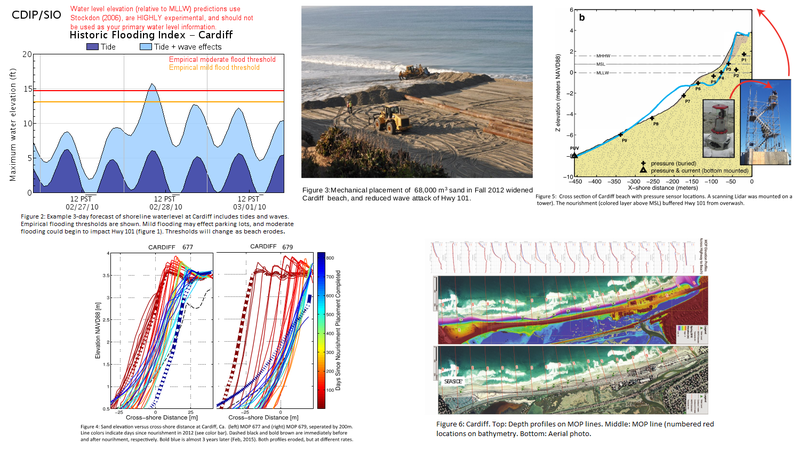 Tides in California can be predicted accurately for many years in the future. Wave forecasts are usually poor more than a few days in advance. Furthermore, even given specific wave conditions, the amount of flooding depends on poorly understood site details. For example, for unknown reasons, some locations along Highway 101 can overwash (lower left) while other nearby locations do not. Modern studies of wave overwash use high power computers to simulate a few waves over limited areas with recent surveys of sand levels. Such surveys are usually lacking, and computations are in any case not feasible for large reaches of coastline. The objective of the CDIP water level forecasts is to estimate the vertical elevation to be reached a given coastal location, using a simple, computationally fast model that requires little information beyond wave conditions. 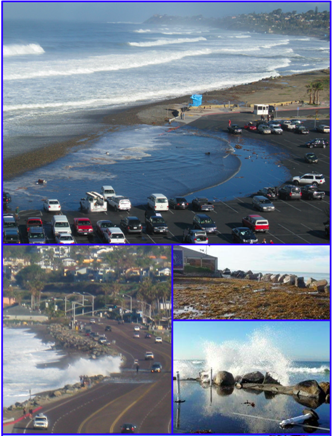 Figure 1: Photographs of wave overwash in California. Figure 2: Schematic of a breaking wave, and wave runup, on a sandy beach with slope β.
SWL is the still water line (water level without waves) determined primarily by the astronomical tide. R is the vertical elevation of the runup above SWL. 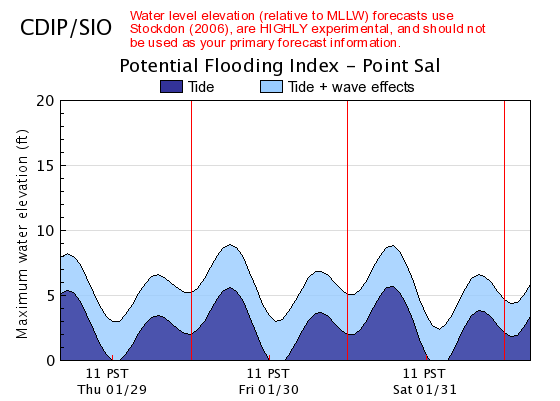 Figure 3: CDIP water level forecast (3 day) at Point Sal. where the deep water wavelength Lo = (g/2pi) T2. Long period swell causes higher runup than short period seas of the same height. Higher incident waves of course cause higher runup. Note that Stockdon uses the spectral peak Tpeak, whereas the mean period Tmean is used here to avoid jumps in R2% in bimodal waves with approximately equal sea and swell energy. On figure 3, the maximum water level is equal to the Tide Level + R2%. Ho and Lo are estimated, in 10m depth, from the CDIP regional wave model. Estimates are averaged over a 500m alongshore length of beach. Tide predictions from the nearest long-term NOAA tide station are used, and the predicted tides are adjusted by adding in the offset between the last observed monthly mean MSL value and the MSL datum (1983-2001) for the tide station. Reference: Stockdon, H.F., Holman, R.A., Howd, P.A., Sallenger, A.H., 2006. Empirical parameterization of setup, swash, and runup. Coast. Eng. 53 (7), 573-588. CDIP generates ‘Flooding Index’ forecast plots based on the tide, wave height, and wave period for a number of locations along the coast. 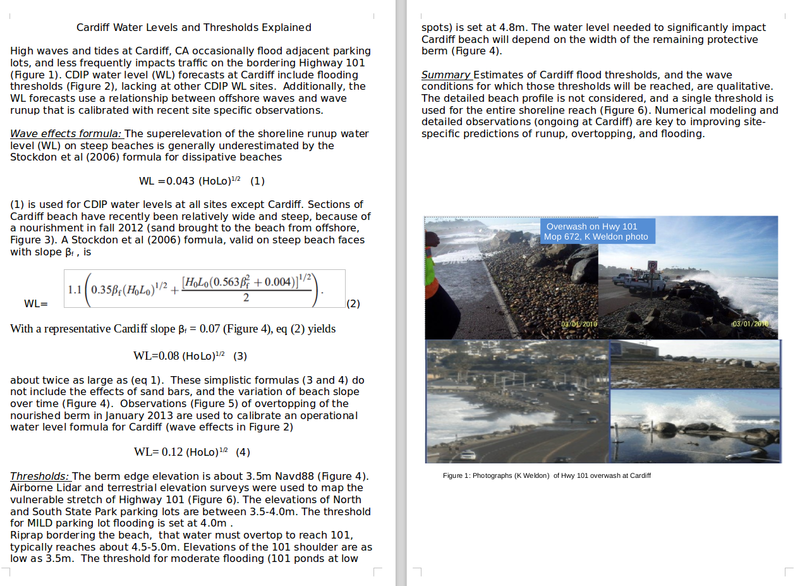 For Cardiff, these plots include specific ‘mild’ and ‘moderate’ flooding thresholds. Details on these thresholds are below. To aid both research and education efforts, CDIP produces a number of customized products for different institutions. Some of these products are specialized plots and data files, geared towards a specific investigation; others are general display pages, intended to educate the public and promote awareness about the numerous oceanographic resources available on the web today. Listed below are examples of the various types of custom products that have been generated. Los Angeles County coastal wave heights generated from buoy readings and CDIP’s swell models are transferred every hour to the Coastal Monitoring Network, whose Watch the Water website provides real-time beach information for all of LA County. 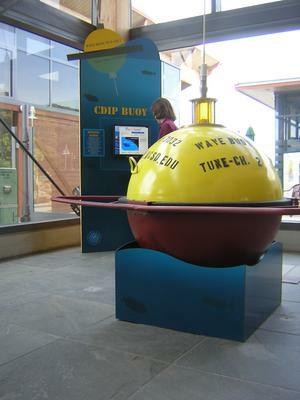 Every thirty minutes the latest measurements from CDIP’s buoys are transmitted to the NDBC and the NWS. Please see the next section of the documentation for more details on these collaborations. In SIO’s Birch Aquarium a number of pages summarizing CDIP activities - as seen in the thumbnails below - were set up in a special display to help educate and inform visitors to the aquarium. A page designed for the Channel Islands National Park Visitor Center in Ventura, CA, provides information which focuses on the waters around the park. 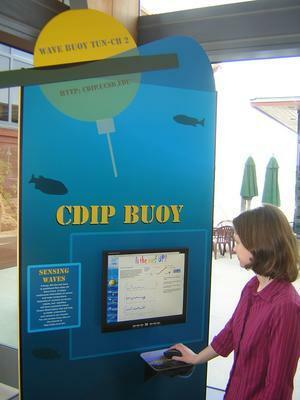 Informational web slide shows have been designed to allow the display of CDIP products at public events such as the San Diego County fair. These shows include the standard slide show and the split-screen slide show. When Alaska Airlines Flight 261 crashed off of Pt. Mugu on January 31, 2000, CDIP immediately started creating wave and wind forecasts for the recovery area that were available over the web.